Wikk's highly specialized custom elevator activation switches are featured in The Blusson Spinal Cord Centre in the Vancouver General Hospital site - The ICORD's (International Collaboration on Repair Discoveries) new home in Vancouver, British Columbia, Canada. Wikk Industries, Inc., a Greendale, Wisconsin-based global designer and manufacturer of the AccessAbility™ automatic door activation solutions line, developed custom INGRESS'R® elevator cab and hall switches for all three elevators in the ICORD centre - an "interdisciplinary research centre for the development of effective strategies to provide functional recovery after spinal cord injury (SCI)," according to http://www.icord.org. Its mission is to give mobility and access control back - enhancing the quality of life - to people with SCI. 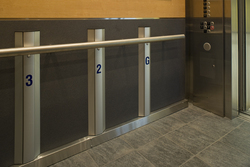 "Placed at entry level and inside elevators, the INGRESS'R is designed so that bumping it in a wheelchair from any angle will energize and activate the up and down and floor level controls," explains Paul Baker, project manager with KONE, one of the world's leading elevator and escalator companies, in its Vancouver division. Another custom INGRESS'R is used as the elevator alarm button to energize voice communication - if the elevator gets stuck or passengers encounter other problems while riding it. The people coming into the building to participate in the spinal cord injury research are quite severely handicapped, according to Baker. They are wheelchair-bound and often do not have use of their limbs - they have very limited mobility and operate the chair with one hand or their mouth. "The challenge that Wikk was able to meet is delivering on an innovative approach that allows total access to someone in a wheelchair that really doesn't have the ability to push a button," Baker says, "and Wikk achieved it cost-effectively while ensuring that the switches were aesthetically pleasing." An elevator consultant referred KONE to Wikk Industries, along with other manufacturers. KONE investigated them and selected Wikk because of the company's extensive customization capabilities and can-do approach. "From Wikk's president down, it was always 'let's see if we can do it.' The company founder, now retired, also consulted - the overall response was quite enthusiastic," Baker recalls. Wikk's contribution to the ICORD centre was over a period of six months, from design concept to shop drawings, to sample approval and delivery and installation. The ICORD centre's grand opening was in November and the building is now open to the public. The INGRESS'R, Wikk's patented 36-inch tall "knowing act" door activation switch, is designed to offer the easiest and most convenient method of providing access for all, including a physically challenged or wheelchair-bound person. It works because its contoured profile allows activation from literally any approach and height - from the tap or bump of a wheelchair, for example - while beautifully integrating architectural integrity with ADA compliance. When wall mounting isn't an option, the INGRESS'R can be mounted onto a bollard post. The Wikkerink name has been known and respected in the door industry for more than 50 years. Lee Wikkerink and his father, Lance, worked together at several major automatic door manufacturing firms before starting their own company. Lee Wikkerink established Wikk Industries, Inc., in 1980 to advance a balanced door hardware product line. The company also developed a line of automatic door carpet controls and what would become the industry standard of "Knowing Act" automatic door devices, commonly called switches. By 1984, Lee's daughters were working with him in the research, refinement, and production of the switch line. When the American's with Disabilities Act (ADA) passed in 1991, Wikk already had a presence in the market with its comprehensive selection of switches, mounts, and accessories that was trademarked in 1996 as AccessAbility. Today Lee's daughter Lori Bedard leads the company and continues to expand the AccessAbility line in response to the design, installation, and security challenges presented to architects, specifiers, and security and access control specialists who must meet strict access requirements. Members of the media can contact Lori Bedard at 877-421-9490 x12. Wikk Industries, Inc. can be found on the Internet at: http://www.wikk.com.